I received my BS in 2001 in Nuclear Medicine from University of Incarnate Word in San Antonio, TX where I spent a year doing clinical rotations in the Nuclear Medicine Department at Brooke Army Medical Center. After graduating, I started in the Medical Physics graduate program at the University of Texas Health Science Center in San Antonio (UTHSCSA), where I focused on utilizing a novel theranostic (dual diagnostic/therapeutic) approach to administer (186Re) liposomes for the treatment of peritoneal ovarian metastases. It was here that I was introduced to the field of biomedical nanotechnology research, which encompassed everything from the basic fabrication of liposomal nanoparticles, to their chemical modification with radioactive isotopes, and their eventual diagnostic/therapeutic application in small animal models. I also utilized various preclinical molecular imaging modalities (SPECT/PET/CT) to monitor their localization. After receiving my PhD in 2006 from UTHSCSA, I immediately began my postdoctoral fellowship at Stanford University in Professor Sanjiv Sam Gambhir’s Multimodality Molecular Imaging Laboratory. Throughout my training I’ve utilized several preclinical molecular imaging devices to sensitively detect the localization and tumor targeting efficiency of various nanoparticle based contrast agents that have been chemically modified with specific targeting ligands, in small animal models. 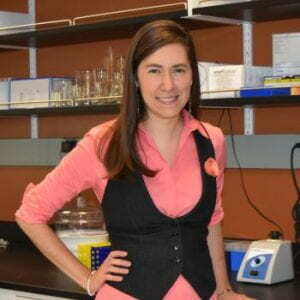 She dedicated the majority of her postdoctoral career toward developing an entirely new molecular imaging strategy that utilizes Raman spectroscopy in conjunction with Raman nanoparticles as a novel approach for functional imaging in preclinical animal models. More recently, I have focused on the clinical translation of this unique strategy—involving the development and fabrication of novel endoscopic and handheld Raman probes in conjunction with tumor targeting Raman nanoparticles for the ultrasensitive detection of various cancers. My current research interests bring together chemistry, engineering and biology to develop new nano-based molecular imaging strategies with the goal of providing clinicians with better functional imaging tools. More information about Cristina Zavaleta’s research.